Nico Bätz is Graduate Assistant - PhD at the Institute of Geography and Sustainability (IGD), University of Lausanne since August 2011 under the supervision of Prof. Stuart Lane. Nico Bätz obtained his diploma in Landscape Planning at the Technical University of Berlin (Germany) and the MSc. in Soil Science – Specialization Land Science at Wageningen University (Netherlands). 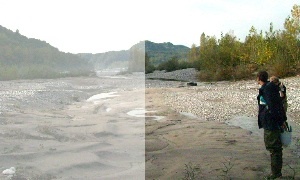 He finished both studies by an integrated master thesis titled “Predicting Ecological Diversity of Floodplains Using a Hydromorphic Model (CAESAR)” supervised by Prof. Friederike Lang and Dr. Arnaud Temme. This research, has been the starting point of his actual research field, related to the integration of vegetation and soil characteristics and processes into hydrogeomorphological modelling, thus considering a more holistic view labeled the Fluvial Critical Zone.